With an average wage of over $78,000, Florida’s film industry is employing more than 26,000 individuals with over $2 billion in payroll. 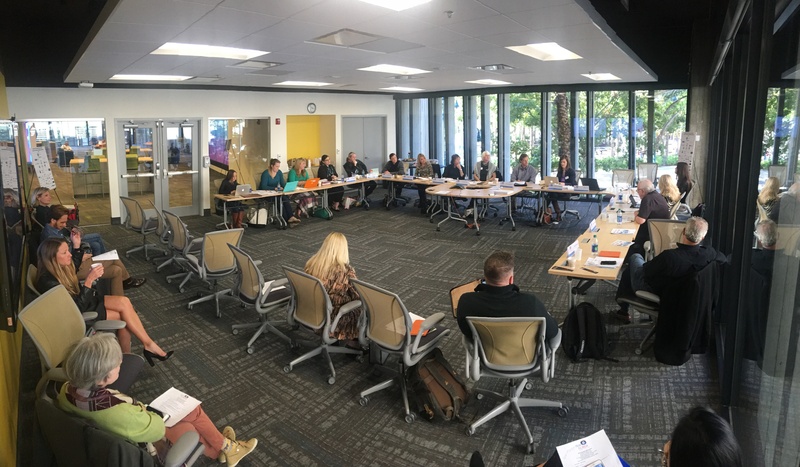 Leaders in the industry from across the state gathered recently to discuss how to keep Florida’s film industry competitive. The Orlando Economic Partnership’s offices housed a day full of committee meetings on December 11 with discussions ranging from marketing to legislative priorities for the upcoming session. With the absence of the Florida Entertainment Industry Financial Incentive Program (Florida is 1 of only 17 states without an incentive program) the industry leaders are working in overdrive to keep the local locations and crew in the forefront of the industries decision maker’s minds as commercial and television pilot season approaches. This past fiscal year in the Orlando region alone there was a 78% increase in permitted production days in the commercial sector. This substantial growth is attributable to the experienced crew, talent and support services, variety of locations and incredible local governments who worked with the Orlando Film Commission to execute permits for over 200 productions that came through the film office. The Film Florida full board meeting was held the following day at the Dorothy Lumley Melrose Center for Technology, Innovation and Creativity (The Melrose Center) within the Orlando Public Library, a branch of the Orange County Public Library System. The Melrose Center is a 26,000-square-foot digital technology center offering audio, video and photography studios, simulators, a fab lab with 3D printers, computers with the latest editing software that is all available to the public for content creation. The Orlando Film Commission was proud to share this phenomenal local resource with friends from across the state, who all walked away with their own ideas of how to work towards similar programs in their hometowns. Women in Film & Television – Florida (WIFT-FL) hosted their 16th annual Jingle Mingle at Historical Dubsdread in College Park on the evening of December 11. The primary focus of Jingle Mingle is to fundraise for the organization’s scholarship funds supporting Florida independent filmmakers. This year, $6,000 in scholarships were awarded thanks in large part to the funds raised from last year’s event. The combination of the Film Florida Quarterly Meeting and the Women in Film and Television – FL’s Jingle Mingle in Orlando each December produces one of the largest film industry networking events in Florida spurring innovation and collaboration to keep Florida’s film industry in the spotlight. Women in Film & Television-Florida (WIFT-FL) is charged with building positive images of media-makers (both women and men), empowering them to achieve their highest professional/creative potential, and helping create more job opportunities throughout the State of Florida. As an organization, we will continue to search for and retain members who have a minimum of two years’ experience working in the film, television and digital media industries. Film Florida is a state-wide not-for–profit entertainment production trade association that represents Florida’s film, TV & digital media production industry. Our members include a who’s who in the Sunshine State’s film and entertainment industry – whether making things happen at a local film commission, representing a labor organization, educating tomorrow’s industry leaders, laboring behind the camera, developing the next great video game or app, providing equipment or working behind the scenes as the glue that keeps a project together. Film Florida values leadership, collaboration, courage and informed action and has a mission to provide a true focal point for Florida’s entertainment production industry, enabling the implementation of powerful economic policy, effective worldwide marketing, positive economic impact, and professional standards of excellence. Film Florida’s vision is to help create and maintain a sustainable, professional and productive entertainment production industry in Florida with an international reputation for excellence.